Everett L. DeGolyer, Jr. (1923-1977) was drawn to all forms of transportation, but railroads were his passion. 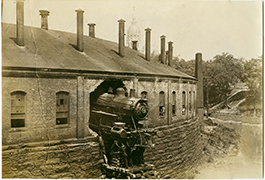 As a result, he built one of the most comprehensive railroad photograph and manuscript collections in the United States, now held by SMU's DeGolyer Library. 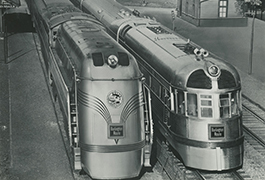 Mr. DeGolyer’s personal collection, the Everett L. DeGolyer, Jr. Collection of United States Photographs, contains some 15,000 photographs and thousands of negatives of railroads arranged by railroad line. 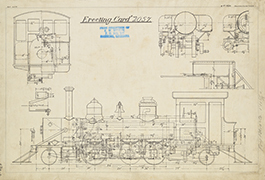 The DeGolyer is home to several Baldwin Locomotive Works collections: photographs, builders’ cards, drawings and manuscripts. 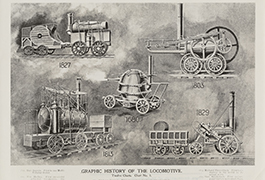 Of particular interest to many railroad enthusiasts and historians is the digitized set of 56 bound volumes from the Baldwin Locomotive Works engine specifications, 1869-1938 collection. There are also many other notable accessions of interest to the researcher. For example, the David Goodyear Collection of Foreign Railroad Photographs contains 56 boxes of photographic prints. 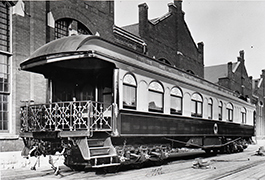 The Jules A. Bourquin Collection has vintage prints and negatives of Horton, Kansas, and the Chicago, Rock Island & Pacific Railroad. The Richard Steinheimer Collection consists of thousands of negatives and is particularly strong in western railroad lines. 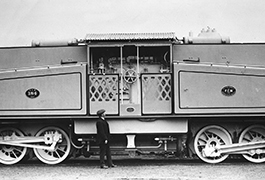 Also related to the railroads are the Roland Collons Collection of more than 100 scrapbooks and 10,000 negatives and the H.D. Conner Railroad Depot Collection consisting of thousands of negatives of U.S. depots. The I. & G. N.